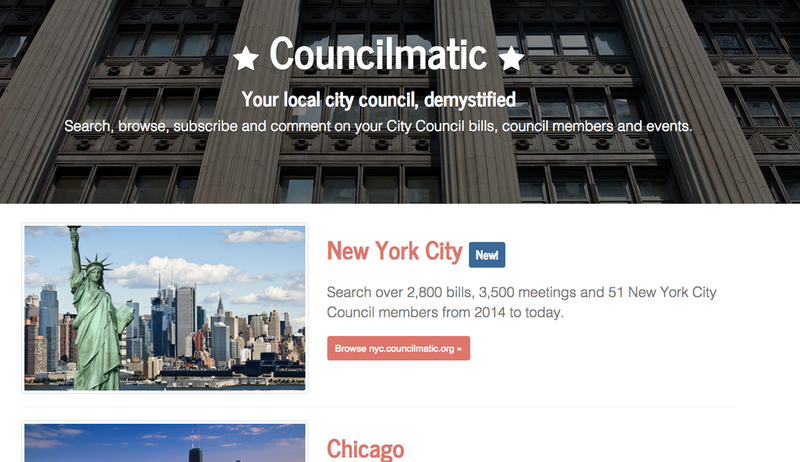 We’re working to roll out Councilmatic to cities nationwide as an open-data public resource. Contact us to talk about Councilmatic in your area: info@councilmatic.org, and we’ll get back to you right away to connect voice. Get in touch! 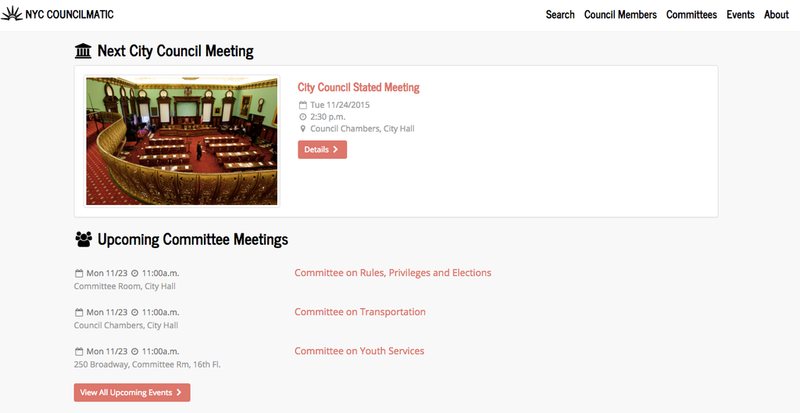 More info: Councilmatic is a new web application for tracking and understanding what’s happening in city councils. Finally, a user-friendly website for everything in local government. Councilmatic is a joint project of the 501(c)3 non-profit Participatory Politics Foundation and the civic tech company DataMade. It’s currently up in three cities: NYC, Chicago, and Philadelphia. Councilmatic is different from for-profit “feedback” platforms for city governments because it’s a uniquely open-data community resource. Bringing Councilmatic to your area now makes possible more local open-government or civic engagement projects in the near future. Open city data – Councilmatic can generate and publish the first open data for city legislation, elected officials, committees, events and more. Other civic projects can access, remix, and analyze this official data for the public. Free, libre & open-source software – Councilmatic can be re-deployed for any jurisdiction – whether a county, a city, or the most-local town council. Its open code prevents the risk of “vendor lock-in” for publishing open legislative data. Use part or all of it, it’s your choice. User-focused interface & design – Councilmatic’s web design and participation tools clearly improve upon most official legislative portals for city governments. 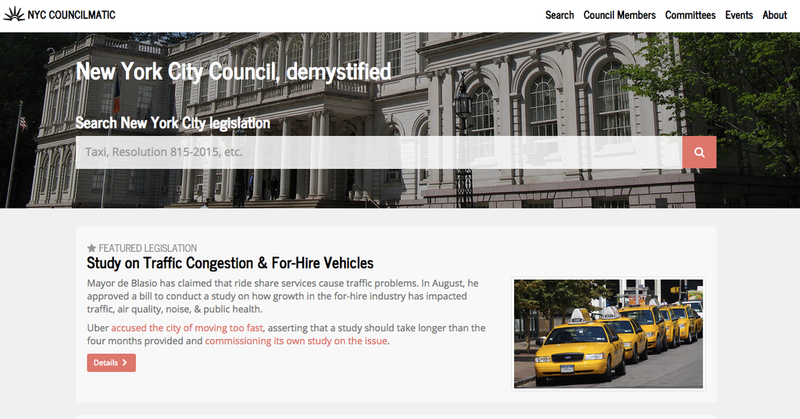 The Councilmatic website is fully responsive, for viewing on mobile devices, with free tracking and comment features. 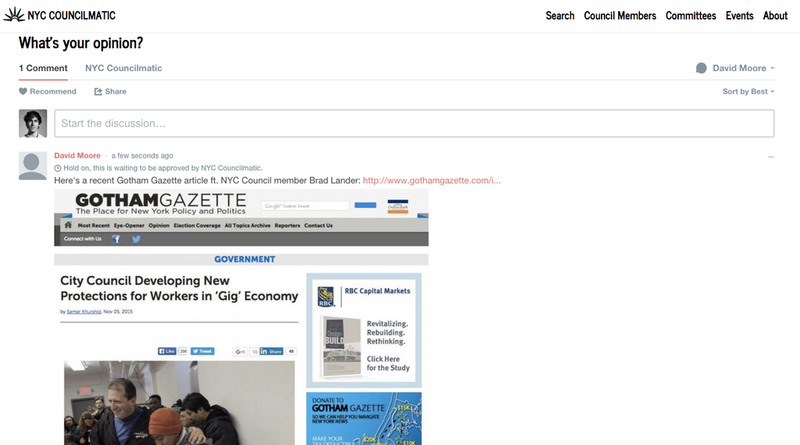 Online public dialogue – Councilmatic in NYC is operating with a public comment program involving “verified” city council offices, community groups, and local media. Coordinated by non-profit PPF, this program works to “close the feedback loop” with local elected officials. 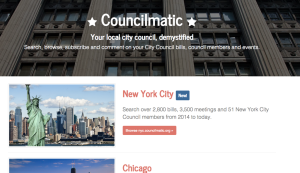 NYC Councilmatic – track legislation, members, events and more, for local engagement. Councilmatic comes ready to publish the following information for a city council or government entity – some, most, or all. It’s libre to remix, so you’re not stuck with a large legacy system – local :civic hacking” groups and Code For America Brigades can help stand up and maintain their own Councilmatics, we can help. First-ever open data source for city council events. Let’s bring this to you. Councilmatic is in the process of developing even more unique engagement features. As a free & open-source project, tools created in one city can be voluntarily integrated into other cities. Comment forums – Councilmatic currently uses the free Disqus comment system for moderated discussion of NYC legislative initiatives and community issues. A custom site comment system with administrative features for government offices is planned for next year. Alerts – users may choose to subscribe to be updated over email, SMS message, or social media about upcoming events. For example, if a resident is tracking the work of the city’s Public Housing Committee, she can opt to receive an email with the next meeting details and official agenda for advance commenting and sharing with her community. Unique alerts can be created for issues trending in city councils, such as “environment” or “jobs”, or for city council districts affected by legislation, such as “District 6” or a neighborhood’s name (“Fort Greene, Brooklyn”). SMS Outreach – a goal of NYC Councilmatic was to increase access to official information about how city legislation affects community issues. To connect more residents with their district’s council offices, Councilmatic partnered with NYC company HeartGov to provide a two-way SMS text-messaging platform. Residents simply text a question, idea or concern to the HeartGov number, where it receives a response from a human moderator and referred to the best-available information and resources for advancing it to a resolution. On the foundation of newly open city data, build alerts and public dialogue through comments. Councilmatic can be deployed in your city or town in a number of ways, with different options for its open data, information display, and site features. Contact us to discuss pricing & roadmap in more detail. The first way to get Councilmatic is to secure a charitable grant for the 501(c)3 non-profit Participatory Politics Foundation, or enter into a software development agreement with PPF. For example, a city philanthropist or regional foundation can give a tax-exempt grant to fund PPF’s open-source, public-benefit development and outreach to local partners such as community groups. PPF has previously been funded by the Knight Foundation, Sunlight Foundation, Rita Allen Foundation, and others. A city-based issue group or news company can contract directly with PPF to deploy Councilmatic as well. PPF has previously fulfilled consulting contracts with Google Civic Innovation Program, the Cornell University School of Law, and others. A second way is to enter into a software development and service agreement with DataMade, a leading civic technology company based in Chicago. DataMade has experience and insurance. DataMade’s work makes open data more accessible for journalists, researchers, governments and advocacy organizations through online data viz and analysis. DataMade and PPF will work with city governments so that the development contract works with different procurement thresholds. Our goal is to roll out Councilimatic to cities nationwide as a community project built on the Open Civic Data open standard. After a one-time setup process, Councilmatic for your area will be maintained through a combination of a low annual licensing fee for our open-source support, as well as charitable grants and consulting revenue. Questions and feedback welcome, we’re easy to reach. PPF has worked on legislative transparency for the past eight years, with our OpenCongress – the most-visited non-profit site in the world for tracking the U.S. Congress – and as a founding member of the state-level Open States Project. Read about Councilmatic’s history in our recent profile in Civicist. Contact us to talk in more detail about Councilmatic in your area: info@councilmatic.org, or ping David Moore on Skype: davidmooreppf. Follow @Councilmatic on Twitter and Facebook, and visit Councilmatic.org for more images. Get in touch anytime, we’re easy to reach & eager for new city partnerships.